Have you ever cranked up the volume on the receiver and noticed a lot of distortion? Well, one of the main culprits in such situation is the underpowered amp built into your headunit. Sure, the power handling characteristics of your speakers also come into play, but a good amp will make a night and day difference in terms of sound quality even in a stock situation. With that said, if you want your car audio system to sound quite loud, amplifiers are definitely part of the picture. Some people think that amps are just for serious audiophiles and car audio enthusiasts who want the whole world to hear their bass miles away. However, as a matter of fact, an amplifier is a key product for anyone who cares about great sound quality. A powerful amplifier will breathe life into your music, bringing out all of its excitement and detail. Externa car amplifiers are categorized by their number of channels. There are mono channel amp, 2-channel amps, 4-channel amps, 5-channel amps…etc. The right number of channels will depend on how many speakers you have in your sound system. In today’s post we’ll be looking at some of the best 4 channel amplifiers on the market. When it comes to external car amps, Rockford Fosgate is probably one of the most legendary. They’re one of the top rated car stereo brands out there. They’ve been in business for quite a long time and have mastered the art of providing top-notch audio components. 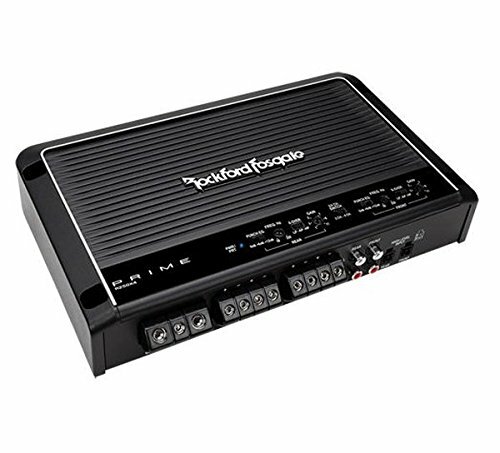 Rockford Fosgate offers a wide range of car amplifiers to cater to a wide audience based on their preference and budget. Their amps fall into three main series labeled “Prime”, “Punch”, and “Power”. Amps in the “Prime” series are the entry-level amps while those in the “Power” series are the company’s high-end amps. More of a middle-of-the-road line of amplifiers, the “Punch” series which offer a great value for the buck. The P600X4 is one of the best performing Rockford Fosgate Punch series amplifier. Built to max out your car audio system, the P600X4 features class-AB circuitry design and uses C.L.E.A.N. technology (Calibrated Level Eliminates Audible Noise) which helps match the vehicle’s source unit to the amplifier saving you from the hassle of setting your amp’s gain yourself. 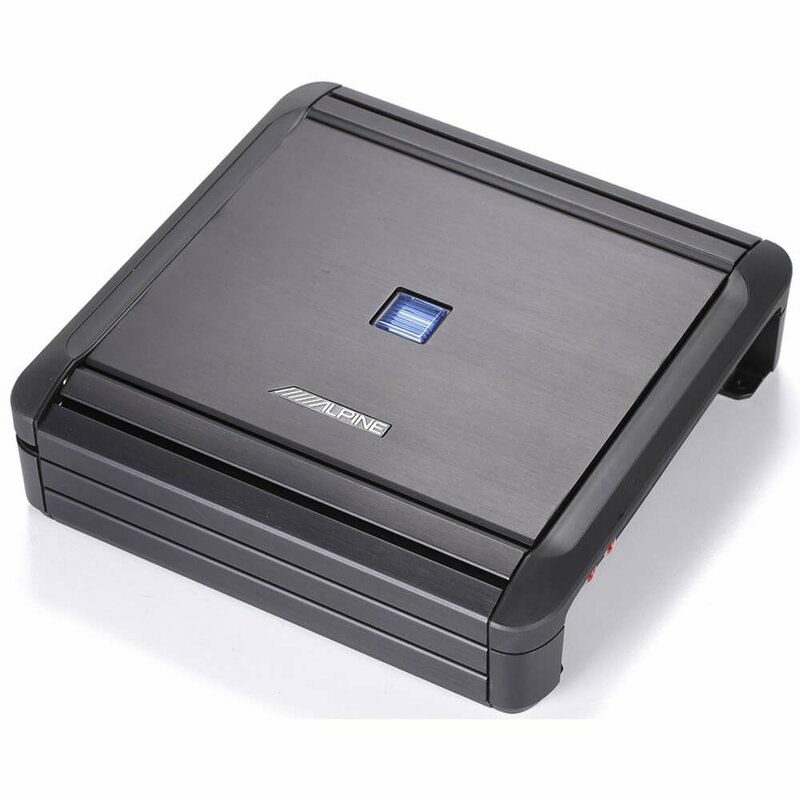 The clipping detectors optimize the amp’s gain settings quickly and accurately to produce optimum power output. Speaking of power output, this 4 channel amp can put out up to 75 watts RMS to each of your front and rear speakers at 4 ohms, which is enough power to make your speakers sing. You can also switch this amp into bridged mode (2-channel mode) to power a couple of subwoofers with up to 300 watts RMS each. Rockford Fosgate P600X4 4 channel amplifier has variable high-pass filters which are meant to remove low bass from your speakers so they’ll play more efficiently, as well as low pass filters which comes in handy for getting the perfect bass output from your sub/enclosure combo. Additionally, this 4 channel amp sports bass and treble boosts, in case you want to add some boom and sizzle back into the mix. If you’re looking for a budget-friendly 4 channel amplifier from Rockford Fosgate, then the R250X4 is a pretty good option to consider. It’s one of the best 4 channel amplifier in the Rockford Fosgate “Prime” series. This amp features high- and low-pass filters, as well as Rockford Fosgate’s famous Punch boost to get maximum performance from the speakers in your vehicle. Additionally, and thanks to its speaker-level inputs, this amp can be hooked to almost any system, even a factory stereo. The R250X4 sports a heavy cast-aluminum chassis which efficiently draws heat away from its internal parts, ensuring reliable, long-term play. Furthermore, The amp’s built-in sensors keep track of the output current and power supply temperature, ensuring that fluctuating speaker impedances (which do change constantly during play) or even a short circuit won’t damage your amp. 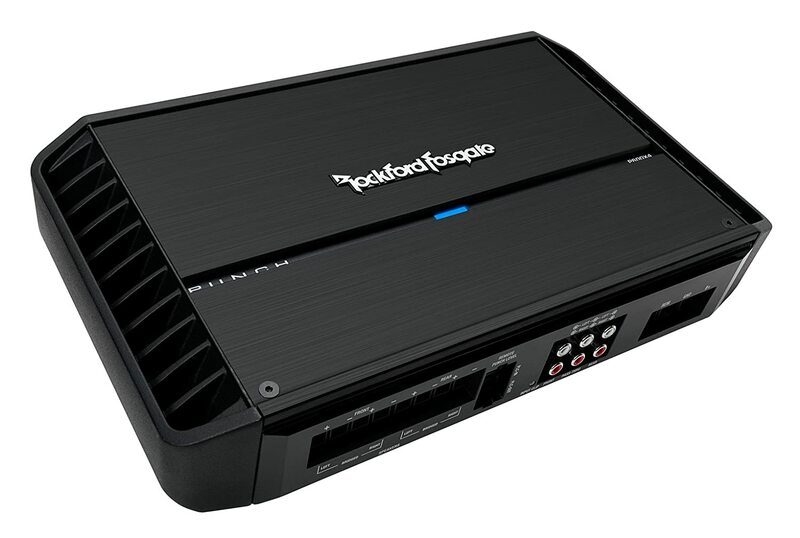 All in all, Rockford Fosgate Prime R250X4 is a great budget-friendly 4 channel amplifier. It’s not the most powerful multi-channel amp out there, however, it’s the perfect amp for waking up your aftermarket speakers. The R250X4 sounds very clean and has no distortion. The only downside to this it is that it tends to get a bit hot after it’s been running for a long time. Alpine was established in 1967 as a joint venture between Alps Electric Company, one of Japan’s leading manufacturers of electronic components, and Motorola. It’s one of the most recognized brands in the car audio industry with products ranging from speakers and subwoofers to receivers and outboard amplifiers. The MRV-F300 is one of the best 4 channel amps that Alpine has to offer. This budget-friendly amp is super compact. It’s housed in a well-designed dark brushed metal chassis, and it’s still relatively lightweight compared to conventional older amps of the same power rating. This Alpine amp is quite efficient thanks to its class D circuitry which provides continuous clean power to your speakers, operating at 80% efficiency far greater than conventional class A or B amplifiers. In 4-channel mode, the Alpine MRV-F300 delivers 50 watts RMS to each of your car’s front and rear speakers, making for some sweet sound on your drive. You can also switch this amp to 3-channel mode, and power your subwoofer with 150 watts RMS while driving a pair of speakers with 50 watts each. And if you need more power for bass, then you can switch the amp to 2-channel mode and send up to 150 watts RMS each to a pair of subs. This 4 channel amp is featured with an advanced thermal technology system, which rolls back the output a bit when the amp is about to overheat from playing at its limits a very long time. So, instead of shutting down, the amp continues playing your music, until it cools enough to return to full power. As far as audio controls and feautres are concerned, this amp comes with high- and low-pass filters which lets you choose which frequencies that reach your speakers. It also comes with bass boost which lets you apply some extra low-end punch. Alpine MRV-F300 is an excellent sounding amplifier. It’ll easily drive your speakers without giving out, making your music sound full and clear. Kenwood is another well-established car stereo brand which offers quality audio products for reaosonable prices. They offer a wide range of different car audio components including receivers, external amps, subwoofers, and speakers. 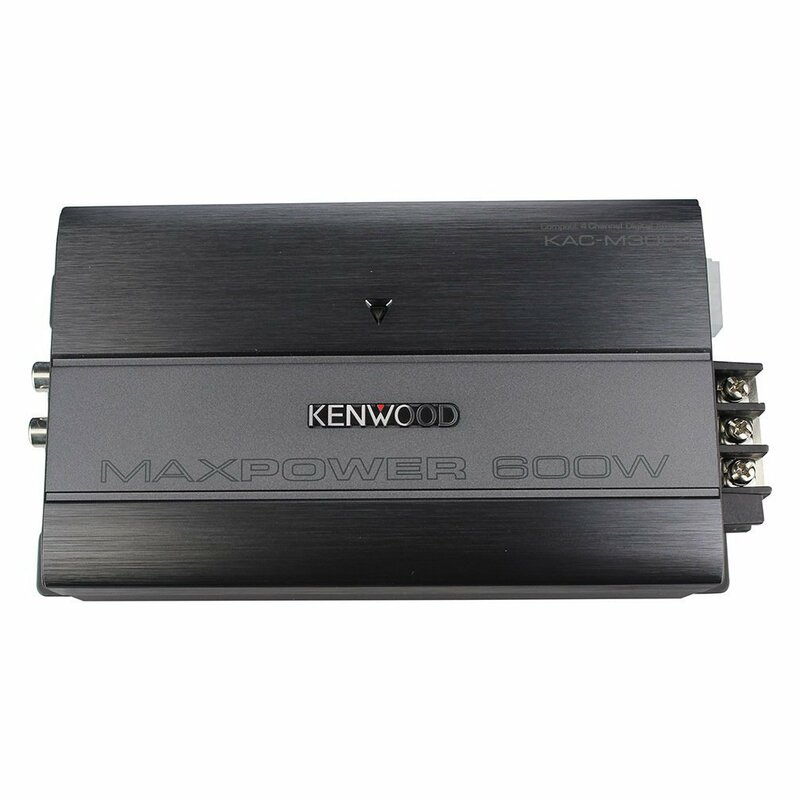 The KAC-M3004 is one of the best 4 channel car amplifiers that Kenwood has to offer. This little powerhouse packs a solid punch and will certainly bring your car audio system to life. It can deliver up to 50 watts RMS per channel at 4 ohms load. You can also switch this amp to 2-channel mode and send 150 watts to a pair of subs. This amp features conformal coating which protects its internal circuits from water and dirt, making it suitable not only for cars but also for power sports and marine applications. Furtermore, its speaker output terminals feature plastic-covered plugs that provide further protection for those connections. In addition to its variable high- and low-pass filters, the Kenwood KAC-M3004 amp has preamp and speaker-level inputs so you can hook it up to any factory or aftermarket headunit.